Cassidy Preston pursued his passion for hockey over three seasons with the Ontario Hockey League’s Toronto St. Michael’s Majors, then got a taste of life in the minors on an amateur tryout with the IHL’s Muskegon Fury before shifting his focus to post-secondary life. In pursuing his education, Preston first earned an undergraduate degree in Kinesiology from York University, then added his master’s in Behavioural Exercise Sciences, Sports Psychology, and Coaching from the University of Toronto. When not hitting the books, the North Bay, Ont., native also continued his involvement in hockey as he suited up for five seasons of varsity with Ontario University Athletics. His time in the classroom, combined with the experience of his playing days, helped Preston launch Consistent Elite Performance, which aims to help budding athletes improve their mental performance through a unique offering of sports psychology programs. Preston, 31, also remains active at his alma mater, serving as the Sport and Performance Psychology Coach for York University’s varsity squads, while he also teaches the same subject at Humber College. Still, consulting for clients, including teenage athletes and junior hockey players, remains his top focus. “Sport psychology and mental performance mainly focuses on the mental side of the game, how players mentally prepare, how they deal with adversity, challenges, and pressure situations,” Preston told Junior Hockey Magazine as part of its CHL Leaders segment. In reflecting on his days with the Majors, Preston recalls fond memories and friendly teammates, but also a hectic workload that demanded and quickly taught effective time-management skills. “It was a busy schedule playing in the OHL and going to school. I then started taking some of my undergraduate classes at York, trying to balance the junior hockey life where hockey is your main focus while still trying to do well in school,” Preston detailed. “It was definitely challenging but something I got to work through, and I got to learn life skills in terms of managing my time and not having everything focused on hockey because there is more to life than just hockey. Preston also points to the CHL’s valuable scholarship program and how it was instrumental in him pursuing an education that ultimately helped him kick start his career as a sports psychologist. 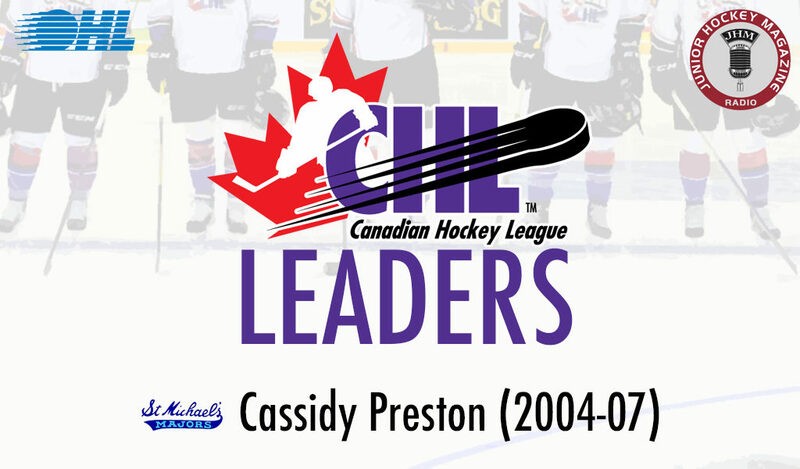 Listen to Cassidy Preston’s full interview with Junior Hockey Magazine here.